Jan Gustafsson takes us through Game 5 of the 2014 World Chess Championship match, an encounter in which Vishy Anand surprised spectators by failing to press for a win in a clearly better position. Jan addresses that issue, but also investigates the question of whether Magnus Carlsen really believes there are only 24 pieces on the chessboard. 1. d4 We should make Vishy an honorary citizen of Hamburg. He avoids Berlin as consistently as we do. 1... ♘f6 2. c4 e6 3. ♘f3 Never change a winning team! This worked in Game 3, so Magnus is politely invited to another Queen's Gambit discussion. 3... b6 And he declines, opting for the Queen's Indian instead. By playing b6, Black intends to develop his bishop to b7 and control the centre with pieces, not pawns. Nah, modern chess is too concrete for such generalisations. Pieces, pawns, whatever works. He is just trying to get the Indian out of his preparation before reached a losing position this time. The bishop on d2 interrupts the queen's control of d5, making it more difficult for White to get in d4-d5. The bishop can no longer go to its (sometimes) ideal square on b2 from d2 and might have to settle for c3 instead. Granted, it is not easy to come up with lines that illustrate these advantages in this very position, which might in turn explain why the idea is not all that popular. 5... ♗xd2+ featured in two games played by a much younger Magnus. One loss and one draw did not incline him to stick to this line. 6. ♘c3 ♗b7 7. ♗g2 Anand is not rattled and just quickly plays the most natural moves. We are still a long way from him being out of book. 7... c6⁉ If a less experienced player made such a move, blocking his own bishop, own would probably start questioning his understanding of the very basics of chess. Does he know the board has 64 squares? Does he know there are 32 and not 24 pieces? Does he know you should not block your own bishop's diagonal? Anyway, c6 makes sense. Black wants to go d5 and be able to play cxd5 after White takes it. 7... d5 8. cxd5 exd5 leads to a structure that is considered to be slightly better for White. 8. e4 c6 did have the drawback of allowing this move. 8. O-O d5 9. cxd5⁈ cxd5 with equality, shows Black's idea. 9. e5 might look like the most natural move, but after 9... ♘e4 Black has been doing alright. 9... cxd5 The structure is fine for Black, who is one move away from going dxc4 and creating a pleasant IQP situation. But his problems are not solved yet - it's White to move! 10. ♘e5! Exploiting the pin on the long diagonal. A wise man once wrote: "the relationship between bishops on g2 and b7 always favours the guy on g2". This is no exception. 10... O-O 11. O-O ♘c6 12. cxd5 A very direct approach. 12. ♗f4 as seen in Van Wely,L (2654)-Tkachiev,V (2625), Dubai 2014 were the main alternatives. 12... ♘xd5 13. ♘xd5 exd5 14. ♘xc6 ♗xc6 15. ♖c1 ♖c8 16. ♖e1 ♗f6 17. ♗f4 leads to a symmetrical position where White keeps a nagging edge due to his more active pieces. A long defence without hopes for victory might be fun in 300, but not in a World Championship match. 13. d6! The point. A cute little tactic, based on the fact that the bishop on g2 is covered, but his counterpart on b7 is not. It does not win material but it does keep Black under pressure. 13. dxe5 ♘xd5 and Black is at least equal. 13... ♗xg2 14. dxe7 ♕xe7 15. dxe5 and, all of a sudden, two pieces are hanging. 15... ♗xf1 16. exf6 ♕xf6 17. ♕xf1 favours White. 14. dxe7 ♕xe7 15. ♗g5! Anand has to keep playing concretely to compensate for his weak d4-pawn. By playing Bg5 he not only pins the knight but also more or less guarantees himself the advance d4-d5, getting rid of the weakness. 16... ♘a5 Carlsen kept blitzing out his moves. He came prepared! 16... ♖ad8 looks natural, but I believe Carlsen rightly didn't allow Anand to sacrifice his queen: 17. ♗xf6 ♕xf6 18. dxc6! ♖xd1 19. ♖fxd1 when the passed c-pawn would not only create unpleasant memories of Game 3, but also cement the white edge, no matter what the engines tell us. 17. d6⁈ might look tempting, but the pawn lacks support. 17... ♕d8 18. ♗xf6 ♕xf6 19. ♕e2 ♖ad8 20. ♖fd1 ♖d7 and Black will reach a very compact position after Rad8. 17... ♕xf6 18. dxe6 The position might look equal, but it's not. Black still has quite some problems to solve to neutralise the superior white pieces - the difference between the knight on c3 and the knight on a5 especially is quite telling. If I understood the press conference correctly, this and the next two moves were still part of Anand's preparation. You just cannot surprise him! Years of very serious opening work preparing for World Championship matches have made him bullet proof in this area. 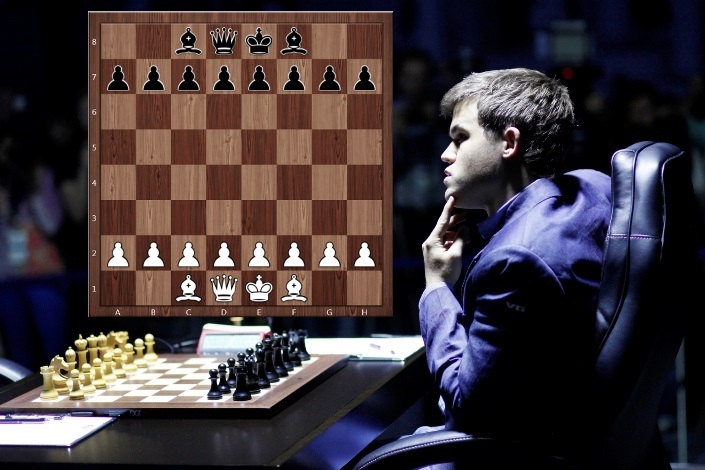 Carlsen was never regarded as an opening expert who had lots of computer lines ready everywhere, but he has always been an expert in choosing the right territory and making his opponent's opening knowledge seems useless. It feels different in this match so far. He has not found a place to hide after 1. d4 yet! Good thing for him that Carlsen is White in games 6 and 7. 18. ♕e2⁉ controlling the c4-square and preparing Rad1, was another way to keep an edge. 19. ♗xb7 ♘xb7 20. ♕f3 is another bonus option. 19... ♕f6 20. ♘d5! The point of White's play. b2 can be left en prise due to some tactics. Black is not given a breather to get his a5-knight back into the game. 20... ♕xb2 21. ♖e2 ♕a3 22. ♖e3 ♕b2 23. ♖b1 ♕xa2 24. ♖a1 ♕c4 25. ♖xa5! bxa5 26. ♘e7+ ♔h8 27. ♗xb7 are the aforementioned tactics. Black might survive this, but there is no question who is better. 21. ♗xd5 ♖ad8 22. ♕f3! The only good move. 22... ♕xb2 Facing a choice between two unpleasant positions, Carlsen goes for the one a pawn up. The bishop is stronger than the knight. The light squares on the queenside are weak. Just imagine a white king on a6 in the future. 23. ♖ad1 The white forces are perfectly coordinated, while the knight on a5 is still out of play. Black is fighting for survival here. 23... ♕f6 A good practical decision. Reducing material should increase the drawing chances. 24. ♕xf6 gxf6 25. ♖e7 ♔g7! 26. ♖xa7⁈ It is always nice to restore the material balance, but this move loses a huge chunk of the advantage superior home preparation had provided. 26. ♔g2 was one way to keep the pressure, but 26... ♘c6 27. ♖c7 ♘e5 28. ♖xa7 ♖d6 29. ♗b3 ♖xd1 30. ♗xd1 ♖d8 31. ♗b3 ♖d2 might lead to enough counterplay to hold the game. 26... ♘c6 Back in business! 27. ♖b7⁈ He is not even trying to play for a win! 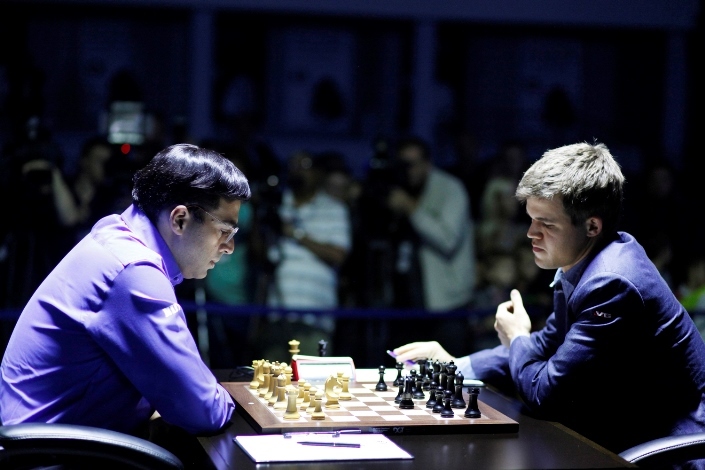 Anand probably did not believe that there were serious chances any more and considered it a better decision not to lose any more energy on this game. In my Armchair General capacity I have to point out that I believe this would have looked very different had the colours been reversed. And that I believe that Anand will have to go after even such small chances in order to win the match. 27... ♘b4 This leads to the exchange of the remaining queenside pawns and is the reason why 27. Ra4 had to be played in order to continue the game. The rest requires no comment except for the fact that the engine Stockfish still gave +1 for White here, leading to some false hopes for Vishy fans. This is a dead draw. A tale of two halves: Great opening knowledge by Anand once again. I am not sure we can call it preparation because it is certainly not something he could have expected for this game or maybe even this match. 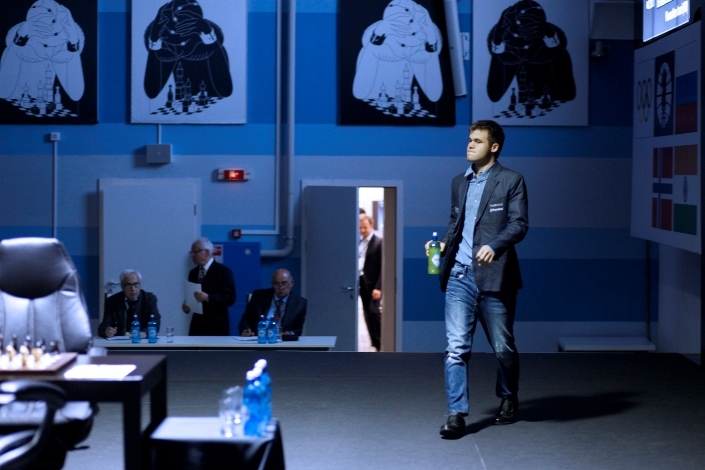 Improved opening preparation by Carlsen - he called it ok himself - but he once again ran into an opponent who knew more. Later on, Carlsen was his resilient self. The choices he was facing between 20. ..Bxd5 or 20...Qxb2 and 22...Qxb2 or 22...Qxf3 lead to similarly unpleasant situations, so he just took one. Qf6 and Kg7 strike me as good decisions. The bad news for Team Carlsen is there's no safe hiding spot against 1. d4 yet. The good news is that he has 2 Whites in a row now. Anand knew everything, saw everything, but did not push hard in the end(game). Choosing 26. Rc7, 26. Kg2 or 27. Ra4 was a freeroll. The outcome might have been the same, but there was some upside and no risk. The match is heating up, let's check out game 6! All the World Championship games can be found live or for replay on our broadcast page.